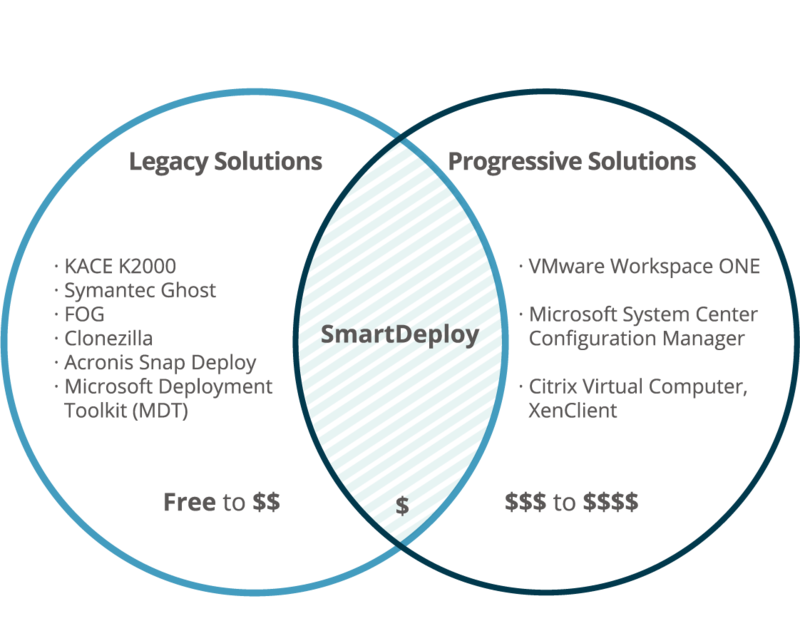 Find out how SmartDeploy compares to Symantec Ghost, Microsoft Deployment Toolkit, and Acronis Snap Deploy. Independent benchmarking company, PassMark Software, concluded that SmartDeploy outperforms the competition. An end-to-end deployment with SmartDeploy, including image capture, takes as little as 36 minutes. Legacy solutions can be unreliable and inconsistent between Windows OS versions. Progressive solutions can be expensive and difficult to learn. 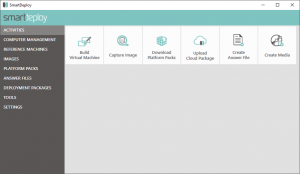 SmartDeploy reliably fulfills the core computer imaging and Windows migration tasks of disk imaging solutions, like Symantec Ghost, while expanding to meet modern IT demands addressed by expensive and complex progressive solutions, like Microsoft SCCM. Built-in best practices, zero-touch remote deployment, and simple driver management allow SmartDeploy’s file-based imaging software to bridge the gap between the simplicity of legacy solutions and the capabilities of more progressive solutions. See how we compare to your ghosting software. 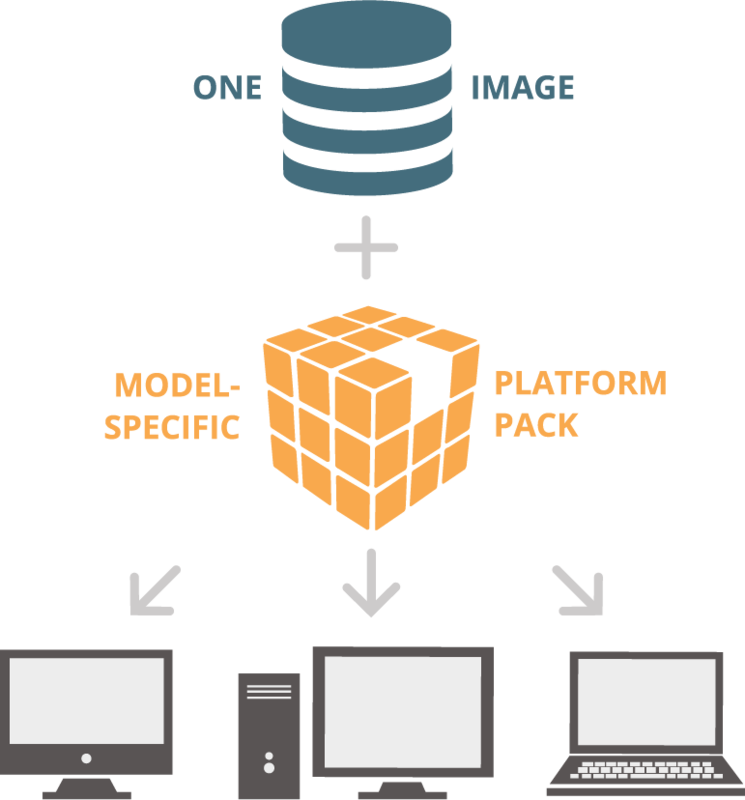 Leveraging virtualization for image creation, SmartDeploy’s modular, layered architecture allows a single image to be deployed to any device. You no longer need to create model-specific images to support various hardware devices over time. Seamlessly deploy your golden image to every hardware model you support without any extra effort. SmartDeploy handles driver challenges by providing model-specific driver packages, called Platform Packs. In this patented approach, only the precise drivers and software-specific settings required for a particular device are injected at deployment time. This approach allows the fastest, most reliable image deployment and highest endpoint performance. Solutions like Symantec Ghost, Acronis Snap Deploy, and KACE K2000 still use disk cloning technology that was developed decades ago. 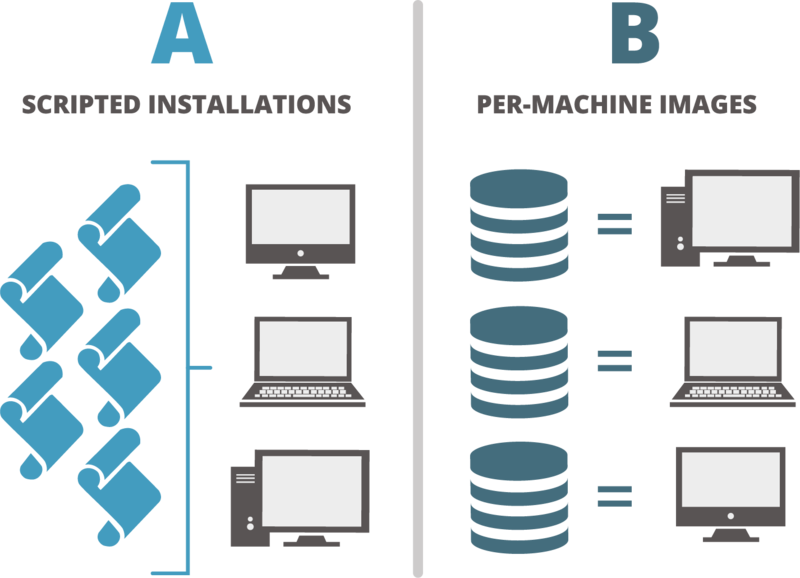 SmartDeploy uses standard Windows file formats and a modern hardware-independent methodology. Some companies choose to avoid model-specific images by writing and running custom scripts after the baseline image is deployed. This requires a higher technical skillset and significantly more time. With SmartDeploy, one image can be deployed to any device without writing any complicated scripts. With ghosting software, you must create and maintain a separate image for each computer model you support. Maintaining a separate disk image of each hardware model quickly increases your image library to an unmanageable size. With SmartDeploy, you’ll manage just one image regardless of the variation of models you support. SmartDeploy guides users through step-by-step wizards, with built-in deployment best practices, allowing technicians of any skill level to achieve success. Since the SmartDeploy trial is fully functioning, users pick up right where they left off with their evaluation once they have purchased. Most users are up and running within a few hours without requiring early or ongoing training. Join a demo to learn everything you need to know to get started. Our driver experts are continuously creating and updating our driver library and currently have support for over 1000 business class models from manufacturer’s like Dell, Lenovo, HP, and Microsoft. Drivers are injected at deployment time instead of being contained in your image file giving you more flexibility. Acronis Universal Deploy and third-party driver tools, inject large files with thousands of drivers on to each device you image. Driver selection is left to plug-and-play which can be unreliable when given such a large driver repository on the endpoint. SmartDeploy Platform Packs contain only the drivers necessary for the model you are deploying, nothing more and nothing less. This reduces the chances of BSOD due to the incorrect drivers being installed and keeps the endpoint from being bloated with extra files. Unlike large, fragmented software companies with outsourced support, you’ll work directly with our knowledgeable team in Seattle, WA. SmartDeploy support technicians respond to all inquiries and proactively post helpful tips at DeployCentral.com. Instead of wasting time climbing a phone support tree, get complicated questions answered quickly by our 300-level technicians. Your feedback is vital to our success. We listen and respond to all customer feedback and requests.